This post will look at a small border in a Gloucestershire garden in a village at the bottom of Bredon Hill. 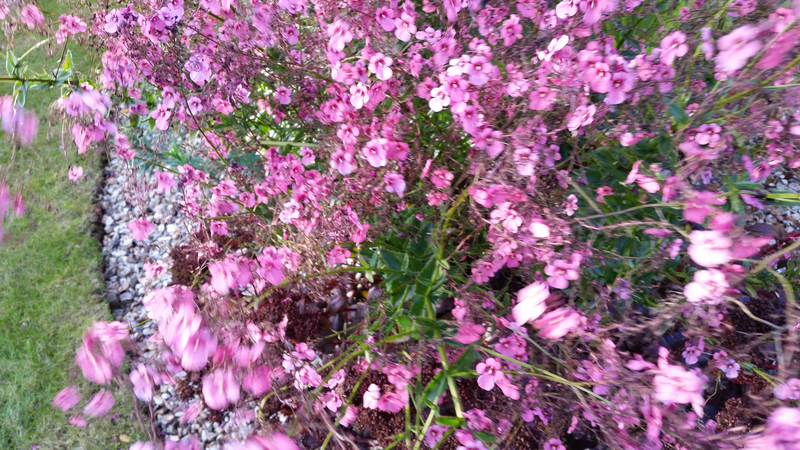 It is a lovely garden, well designed and well cared with a calming atmosphere throughout. The gardeners and owners of the garden are my sister, Penny and her husband, Tony. 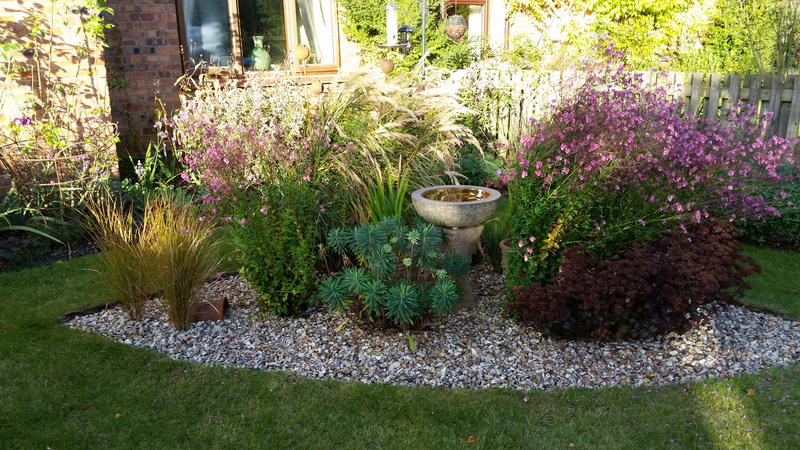 This little border in the front patch is a quarter circle in shape and covers only a couple of square metres but the choice of planting partners and artifacts together create a beautiful balanced feel. The first photo covers the whole border in one shot which gives an indication of its size. 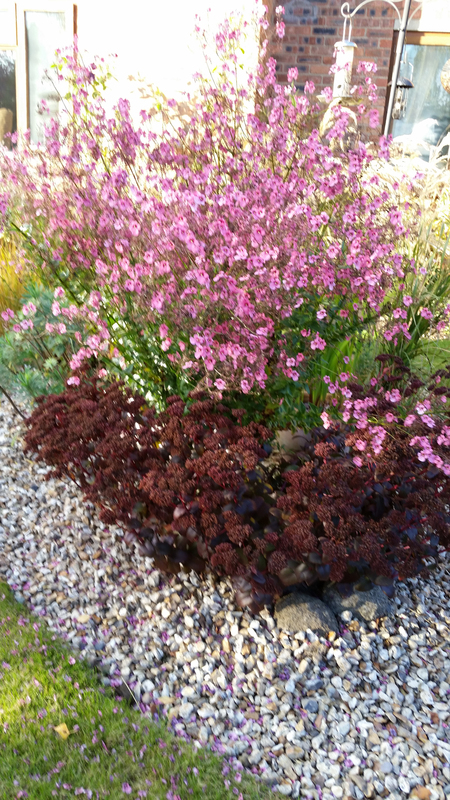 The gravel mulch acts as a foil to enrich the colour palette, the bronzes, silvers and bronzes of the grasses and the rubies and purples of the sedums and diascias. 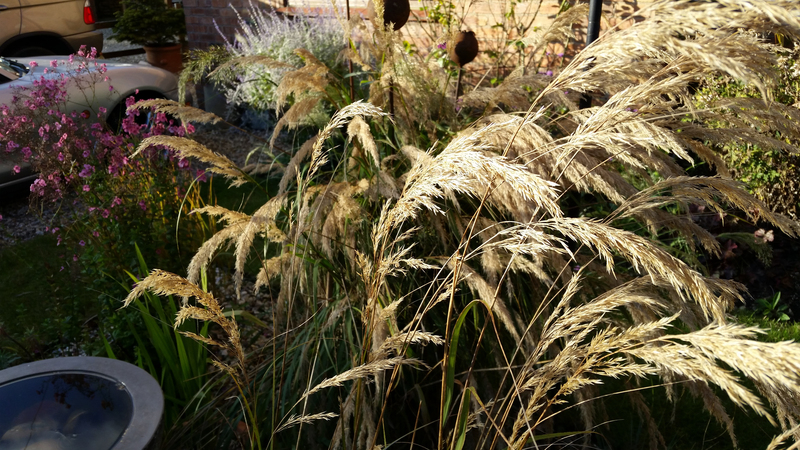 The grasses also move and rustle in the lightest of breezes. 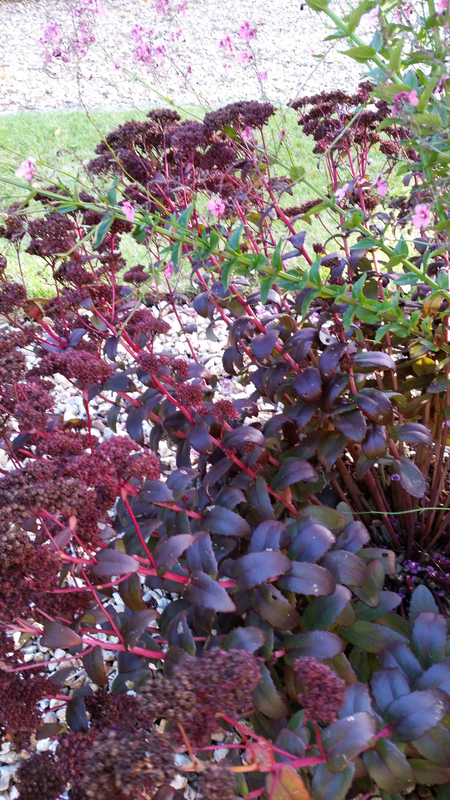 Diascia personata and Sedum Purple Emperor compliment each other beautifully. Silken heads of soft grasses catch every iota of light and absorbs it to put themselves in the spotlights. 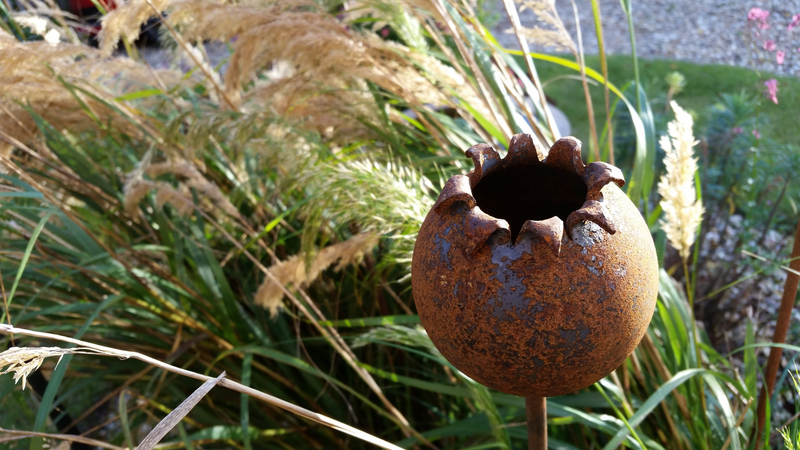 Well chosen sculptural pieces crafted in suitable materials enhance the plants rather than detract from them. 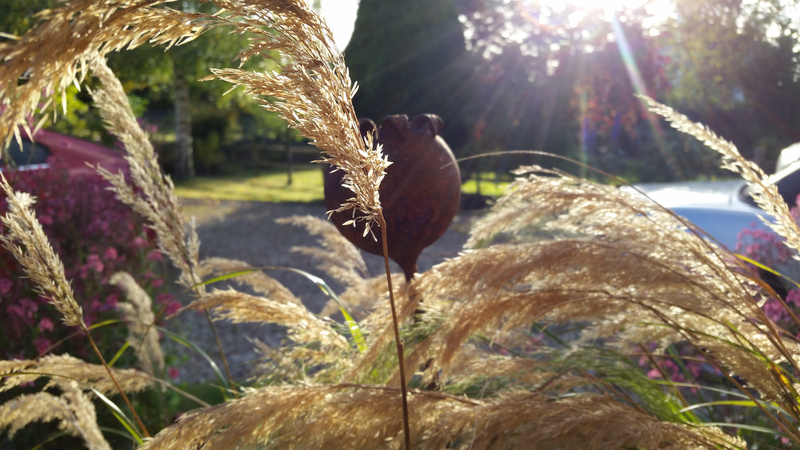 The rust of the corten steel is the perfect material both its colour and texture which allow them to sit beautifully with the silky heads of the grasses flowing past them. 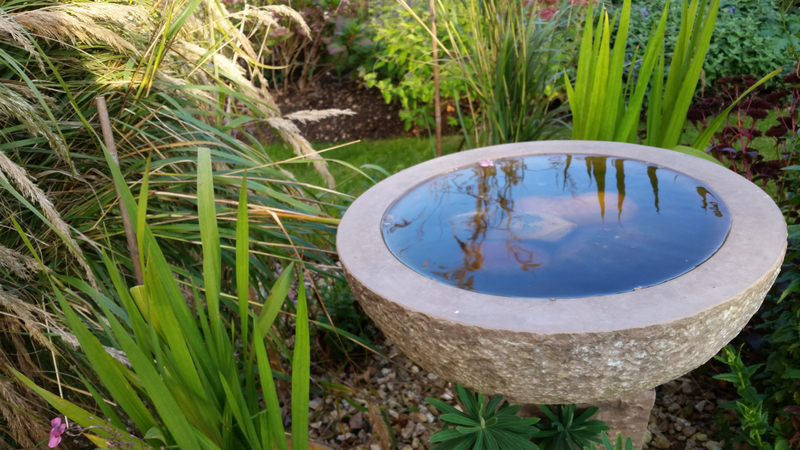 Clear water with a flat reflective surface borrows the colour of the sky and adds it to the composition. 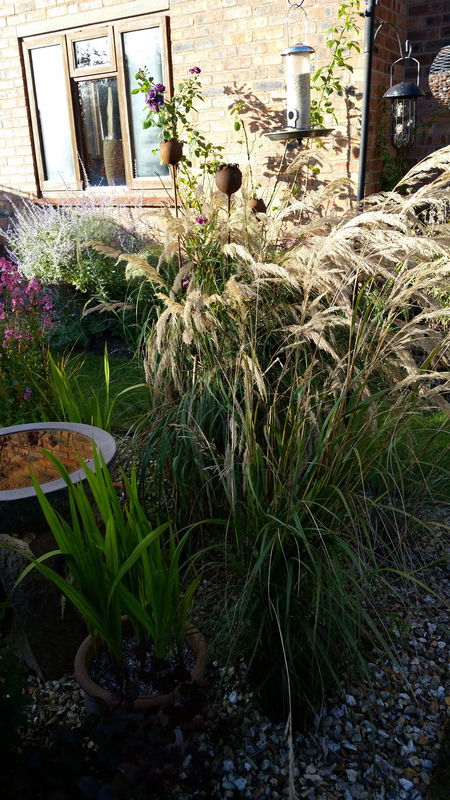 The simple contrast of foliage shape and structure of the plants in the bed works beautifully because of the limited number of different plants used. 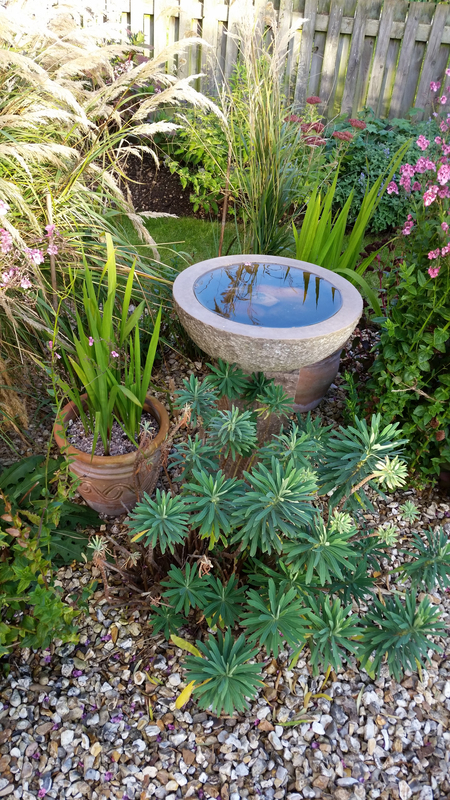 This entry was posted in colours, garden design, garden photography, gardening, grasses, hardy perennials, light, light quality, ornamental grasses, outdoor sculpture, reflections, sculpture, village gardens, water in the garden and tagged diasca, garden sculpture, grass, grasses, outdoor sculpture, sculpture, small gardens. Bookmark the permalink. 1 Response to Take one little border.